Turkish Finance Minister Berat Albayrak humiliated himself in front of international investors while attempting to explain his economic plan to reverse the loss of the Turkish lira’s value. This is according to an article published on Tuesday by Holger Zschaepitz in Die Welt, a prominent German daily, evaluating Albayrak’s presentation to prominent economic circles in Washington. Albayrak, who is also the son-in-law of Turkish President Tayyip Erdogan, outlined a reform package to block and reverse Turkey’s economic deterioration, in a bid to convince some 400 investors gathered at a hotel room in Washington. In an already recessed economy, however, along with the quaking lira and high inflation, the Turkish minister failed to enthuse investors, according to four attendees who spoke to Reuters. Albayrak unveiled his new economy program earlier in Istanbul but it did not meet expectations, according to the German newspaper. Zschaepitz, in his article titled: ‘Erdogan’s son-in-law has disgraced himself to investors’, wrote that markets have subsequently proven that Albayrak’s presentation was not convincing. 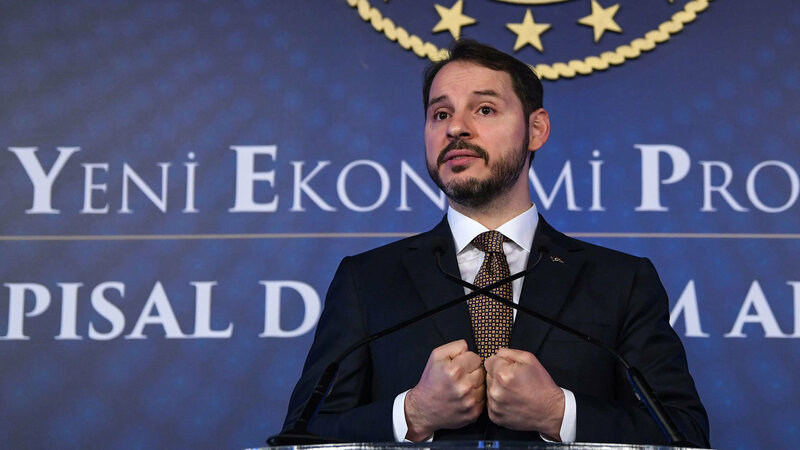 He noted soon after Albayrak’s presentation at the Park Hyatt Hotel, that the Turkish lira lost 2 percent value against the dollar, which marked a total loss of 9 percent since the beginning of 2019. Some investors, according to the report, labeled Albayrak’s performance as ‘the worst ever by a high-ranked Turkish official’. A prominent economist told Axios news agency that Albayrak’s speech was ‘an awful show’. “I have never seen a government representative who is as ill-prepared as he is,” he added. The economist claimed that Albayrak couldn’t convince investors because he did not clarify how he would control high inflation and public debt, and that he did not offer a timeframe for when measures would be implemented. American news and information website, Axios, also mentioned that Albayrak, Erdogan’s son-in-law, replaced two highly respected ministers, despite having limited qualifications. Turkey’s economy has been in recession since the fourth quarter of 2018; therefore, the Turkish lira is not seen as a safe investment to many economists, especially as high inflation increased costs and shook the private sector. The Turkish Statistics Institute announced on Monday that the country has seen the highest unemployment rate in 10 years, with a 3.9 percent increase. Ankara sees foreign investments in the country as the most important step to fix the deteriorating economy, but many news reports say that investors have not been convinced by the Finance Minister’s short-term plans. Turkey’s reform package laid out last week won’t be enough to restore Turkish households’ and foreign investors’ confidence in the lira, one of S&P Global’s top sovereign analysts said on Monday. Turkey pledged last week to inject almost $5 billion into its state-owned banks to help them cope with an expected rise in defaults following the country’s slump into recession, but the plan has been criticized for being light on detail. Earlier this month S&P had said Turkey’s B+ foreign currency and BB- domestic currency ratings were not currently at risk of a downgrade though a further fall in lira would be “very, very bad news” for the country’s companies and banks.